M.A.P $ 750.00 We are proud to introduce our new Imperial Forge “Limited Edition” Collection; masterfully hand crafted and limited to250 pieces worldwide. Using specially forged and tempered folded steel we’ve produced a high quality blade that truly out performs our competition. The Imperial sword Collection exceeds the expectations of martial artistes for strength, cutting power, and most importantly, craftsmanship. Each sword blade is individually hand forged, heat treated, tempered and polished by skilled hands creating a true battle ready weapon. 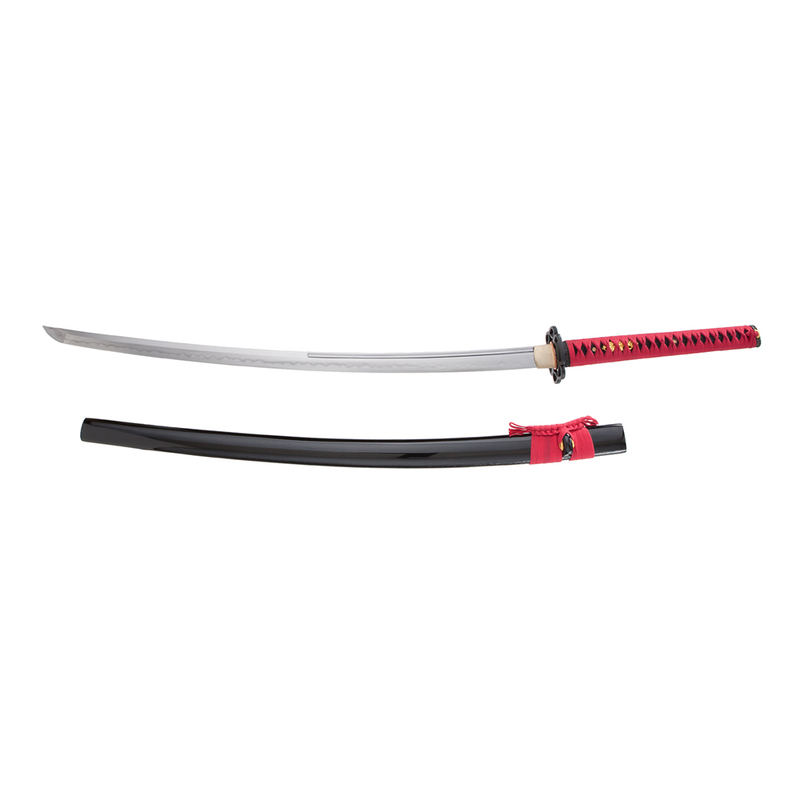 The Limited Edition blade boasts a wide, 9″ short bo-hi which creates a 5 1/2″ balance point. The thick shinogi and convex style ji gives you the ultimate durablity for the riggers of tameshigiri. Red ito / Black same’ . 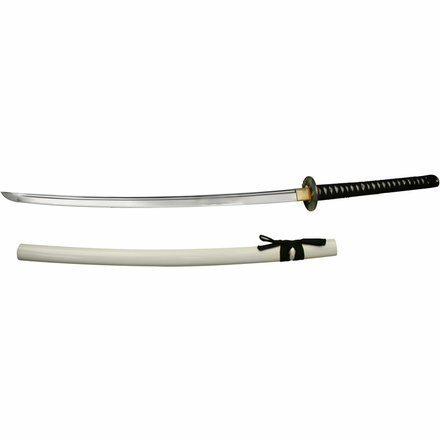 Steel Type:1080 High Carbon Fold / Layers:14 / 16,384 Ha:Convex/Moran Mune:Ihori Hada:Masame Makago:Futsu Weight:2 lbs 10.5 ounces Blade Length:29″ Tang Length:11″ (no taper) HRC:62 / 44 Nihonto Suguta:Shinogi-Zukuri Kissaki:Chü Jihada:Medium Hamon:Sugu Mekugi-ana:Double Pegged Mei:Yes Blance Point:5 1/2″ Tsuka Length:12″ Overall Length:42 1/4″ Cut Ability: Medium / Heavy Keeping with Japanese traditions our Imperial Sword Collection is crafted using only traditional materials and fittings. The Tsuba (guard), Fuchi (collar), and Kashira (pommel) are expertly made and finely crafted from black iron. The Habaki (blade collar) is hand made out of polished brass and each tsuka (handle) is covered in ray skin and tightly wrapped in the traditional cross over style ito (braid). It takes time to produce folded blades of this quality and this is why our Imperial Sword Collection is more difficult to acquire. 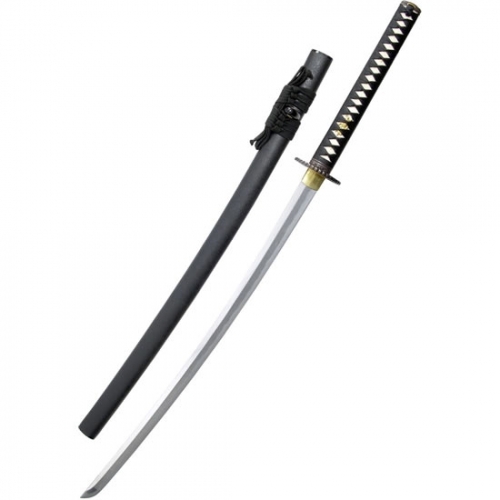 We take great pride in the quality and performance of or swords, we will not compromise this quality and/or performance.